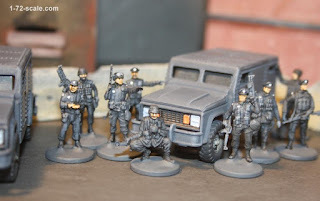 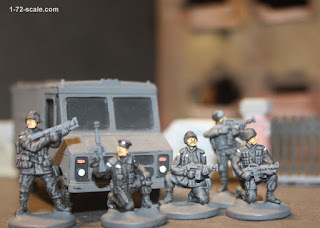 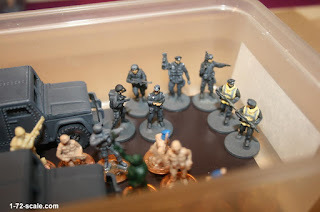 These new recruits have just graduated off the Police Academy painting table (see previous post here) and are ready for action in a forthcoming modern / dystopian future / post-apocalyptic wargame. A few evenings back we had a game (and a few beers) at our mate Alex's place. 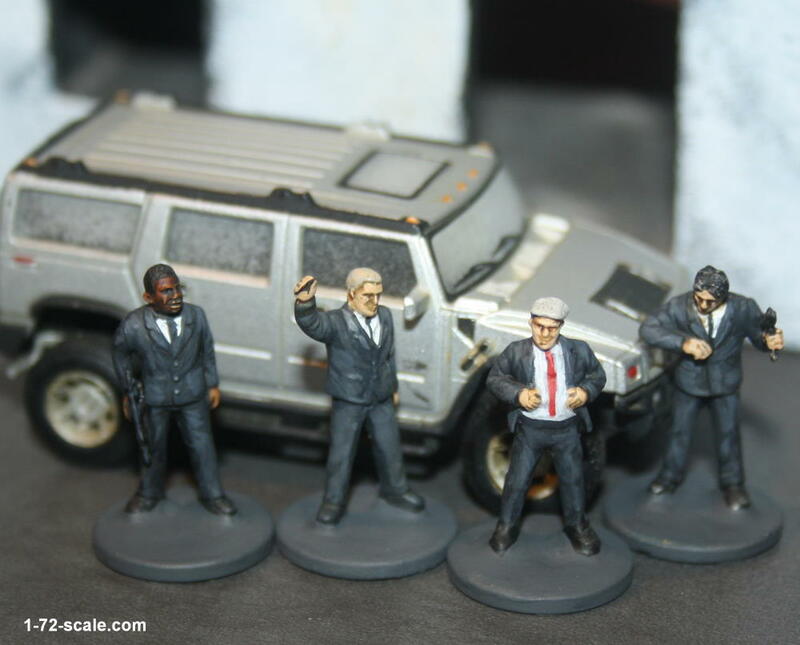 Carlos put the scenario together and acted as umpire. 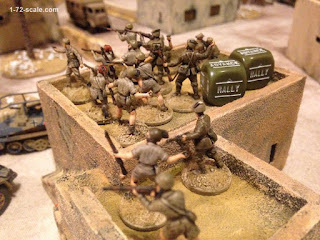 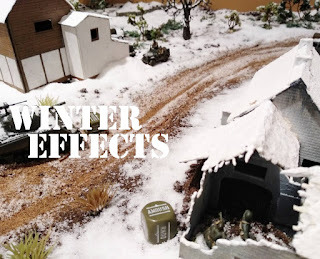 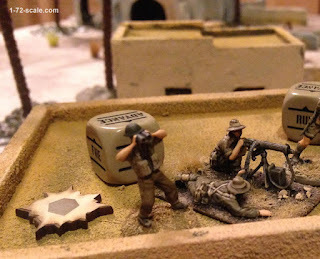 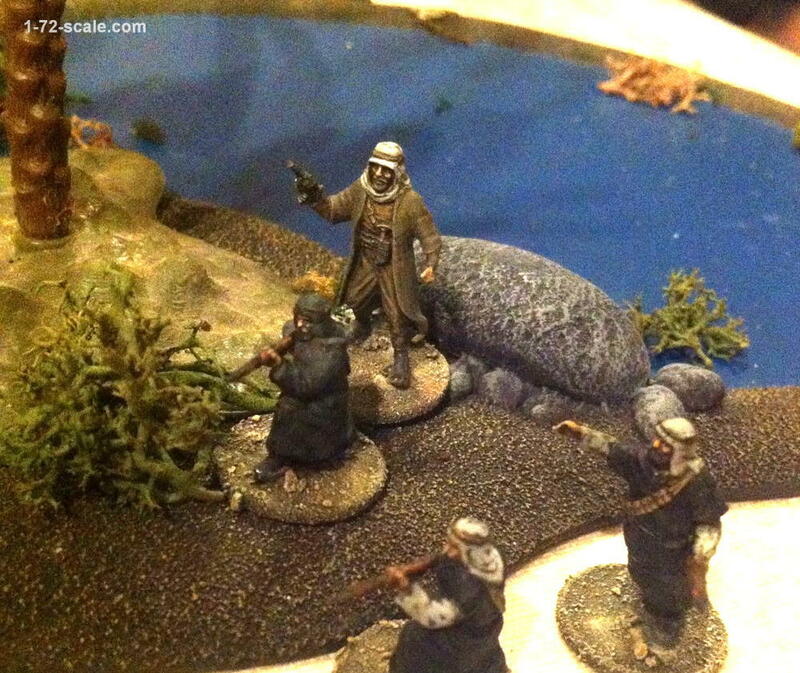 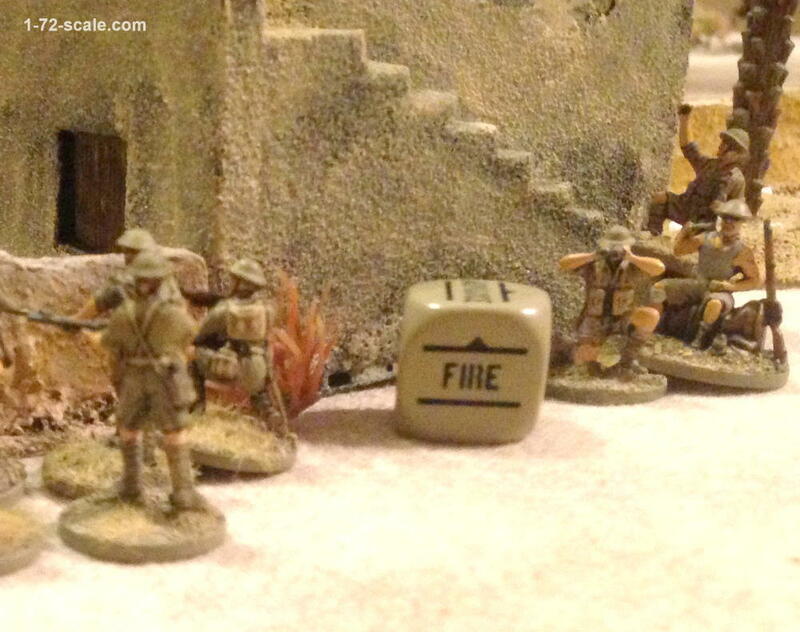 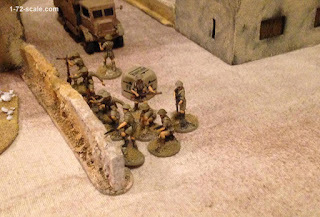 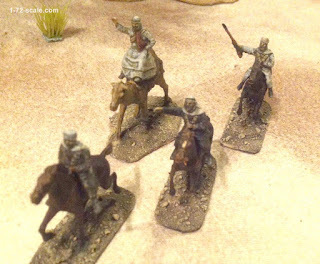 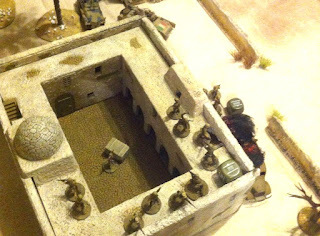 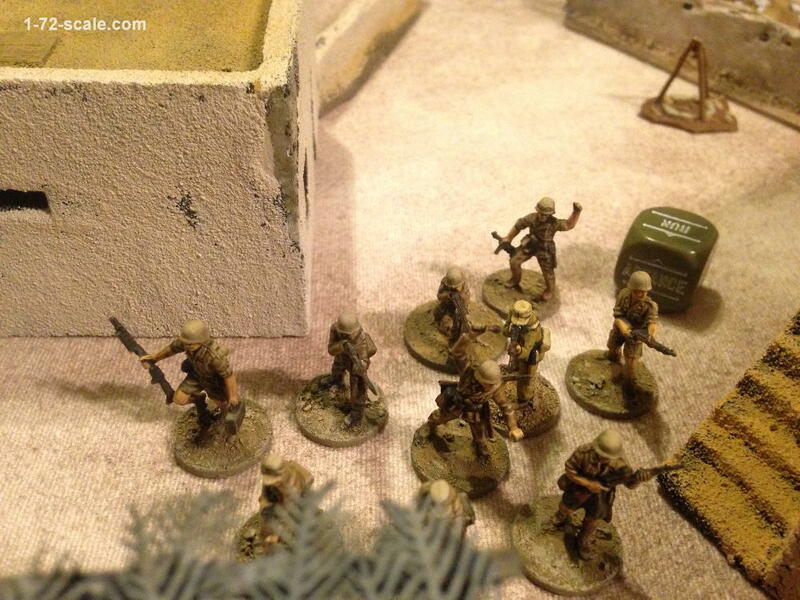 The rules used were Bolt Action by Warlord Games. 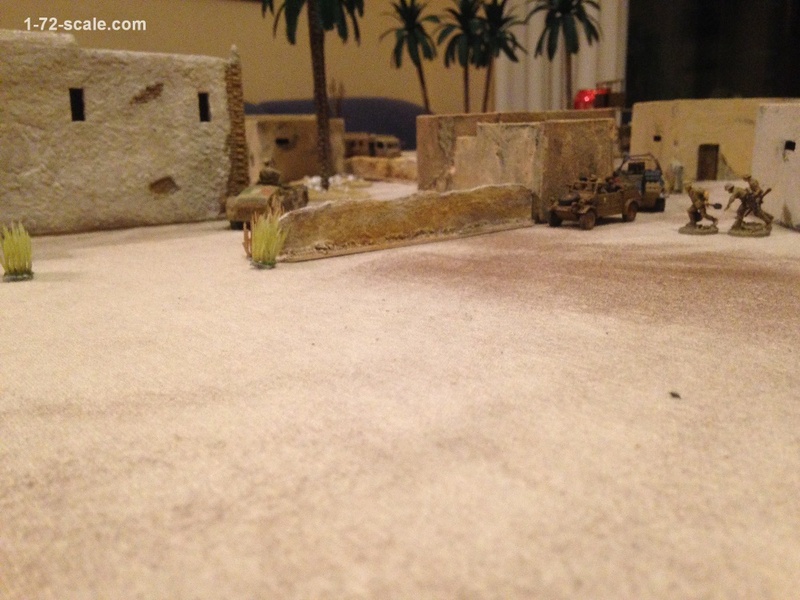 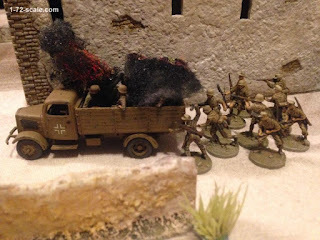 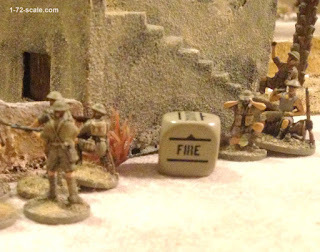 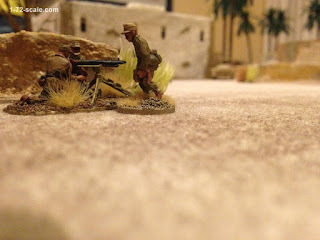 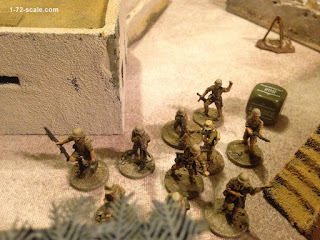 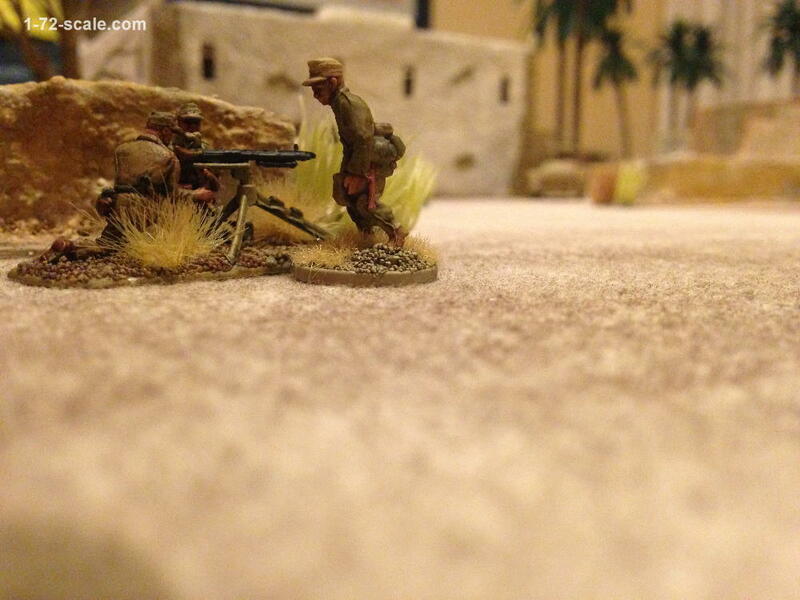 A WW2 skirmish encounter in a small village between British 8th Army squads versus Afrika Korps supported by a squad of Italian infantry. 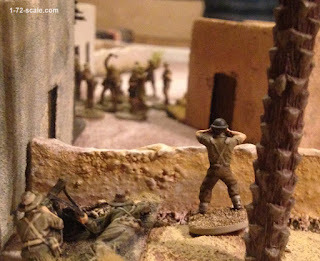 A nice touch was in the middle of the game when a group of armed, and very angry, male inhabitants of the village entered into play, shooting at both the British and the Germans. 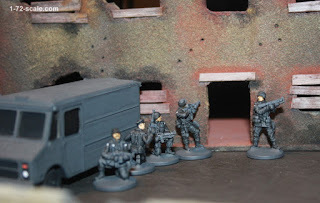 The objective was to capture and bring out alive a double-agent being held in a heavily fortified old colonial fort in the centre of the village. The game was nicely balanced, we played it out twice - the Germans took the objective in the first game and the British the second time around. 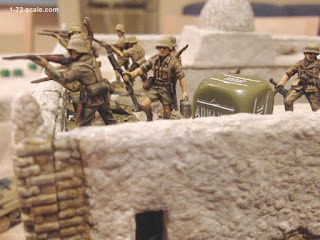 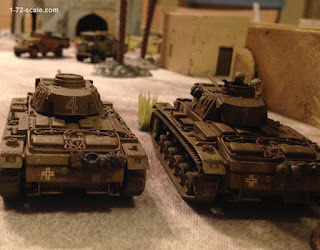 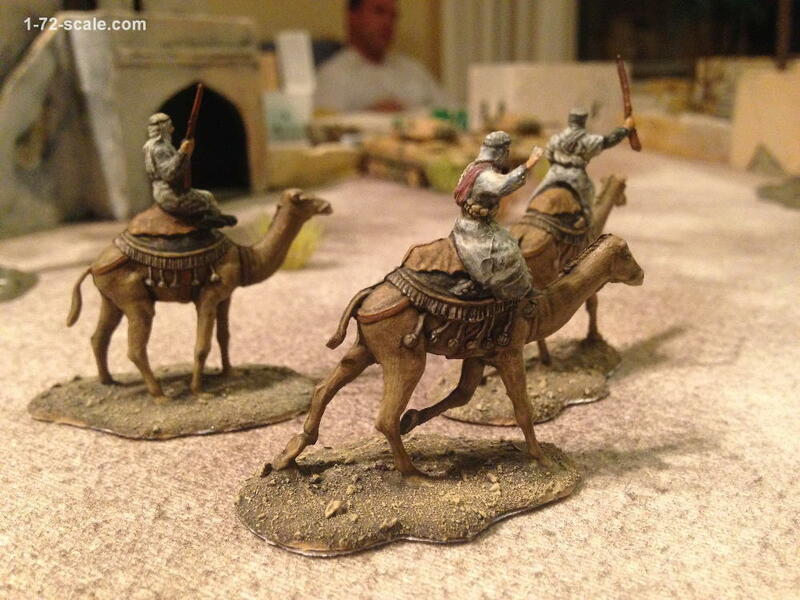 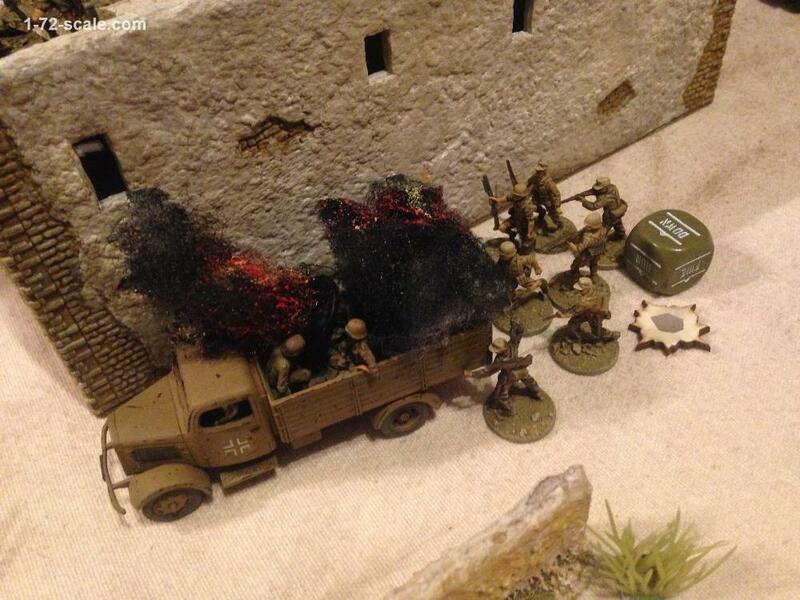 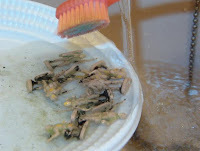 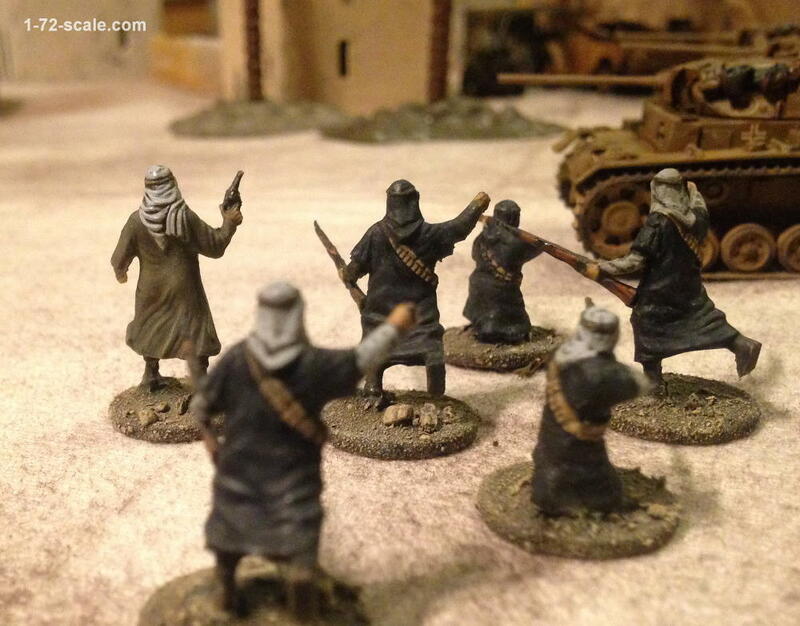 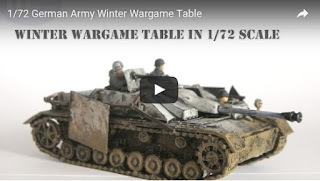 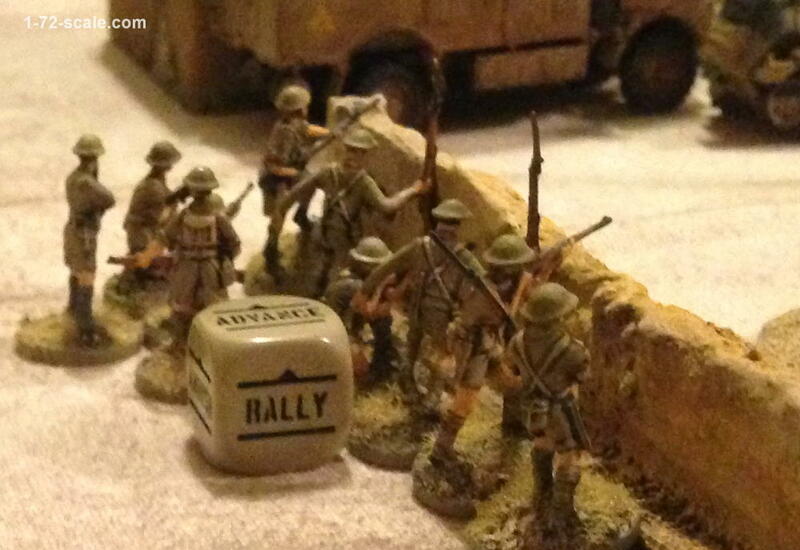 The 8th Army figures are mostly Airfix with a few Revell and Esci 8th Army mixed in. DAK are mostly Airfix with a few Revell, Esci and Matchbox figures. Colonial fort in the centre of the village. 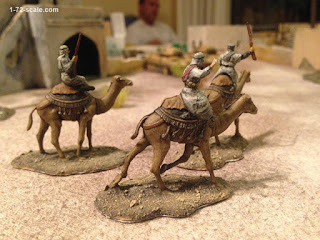 Italeri North African House. 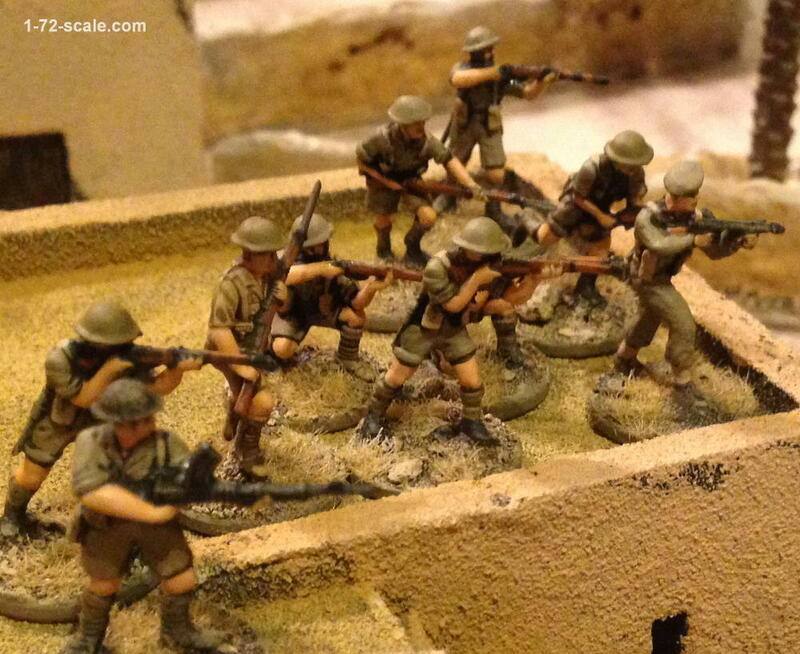 Lovely sturdy and detailed kit, paints up really well. 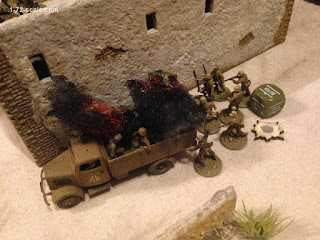 Pegasus models "German Truck". One of Carlos' models, the passengers are seated Revell artillerymen with headswaps. 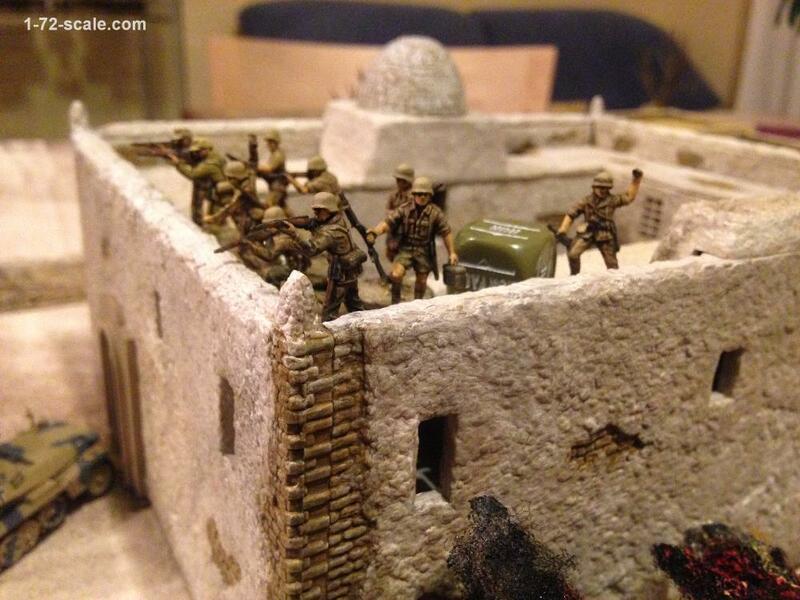 A large Italian squad takes up a defensive position on one of the roofs in the village. 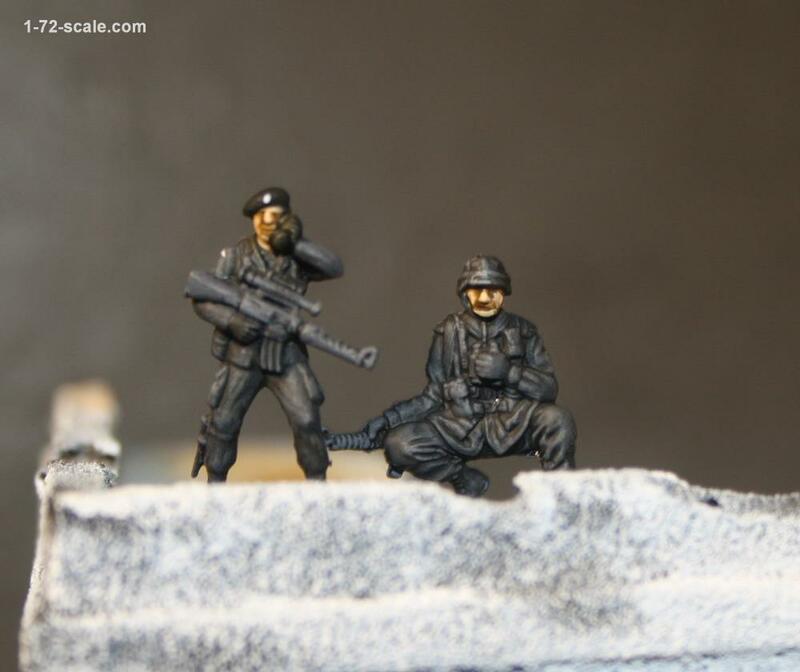 HäT and Esci/Italeri figures. 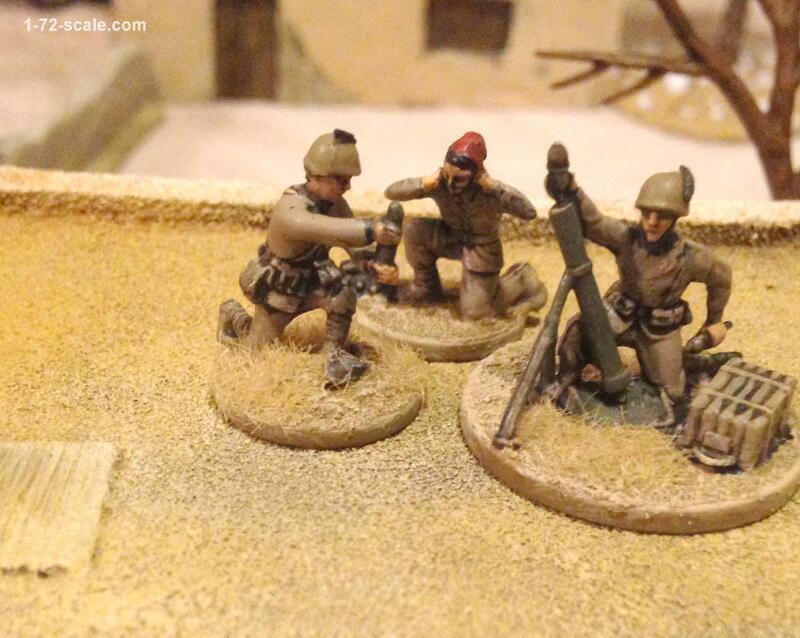 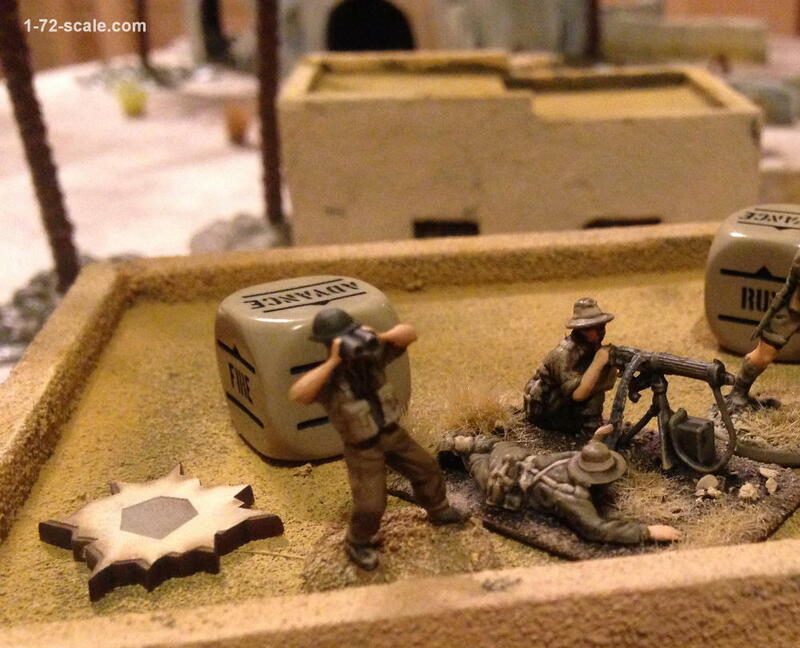 The mortar team are from various sets with new heads. 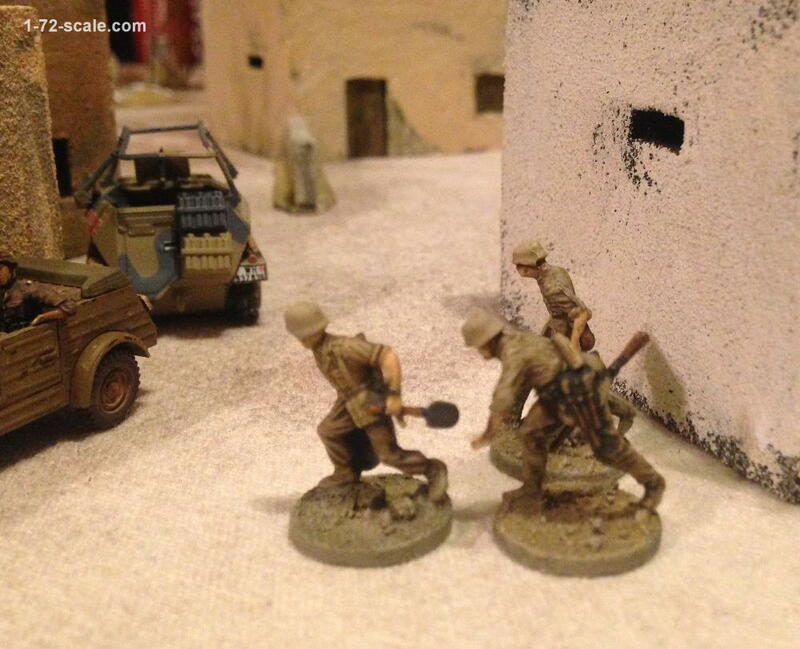 In the midst of the battle, armed villagers attack both allied and axis forces. 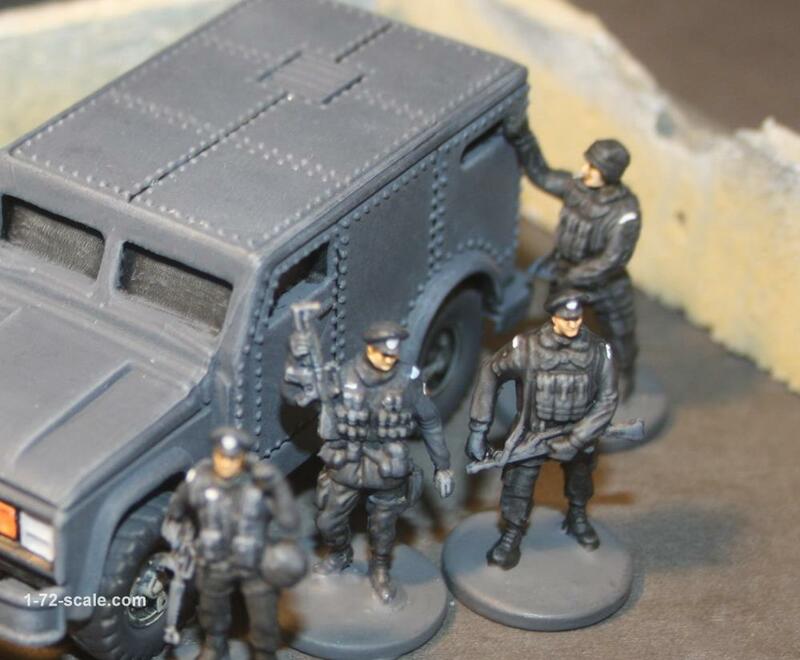 So below in their new job they're posing here flanking a couple of high-ranking politicians. Figures are all 1/72 scale Dapol hard-plastic railway worker figures, with some modifications and all with completely new heads. 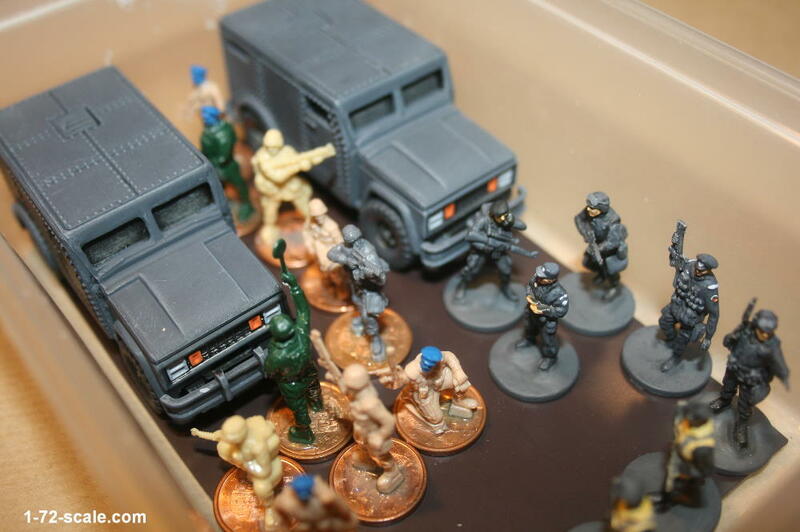 These are a mix of figures from various brands, Esci US 1990s Infantry, Zvezda US Infantry, Revell US & German Modern Infantry, an Esci / Italeri US vietnam war figure, Orion Modern Russian with a headswap, even a couple of Matchbox 1980s British Paras have snook in there. The guys with the cops' typical peaked caps got their heads from the Revell Kriegsmarine WWII German Navy set. 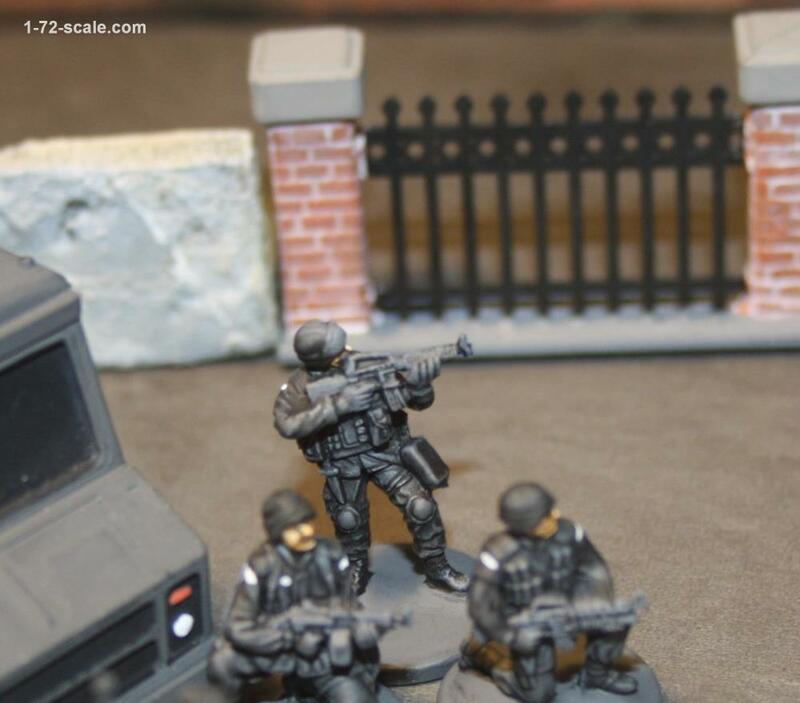 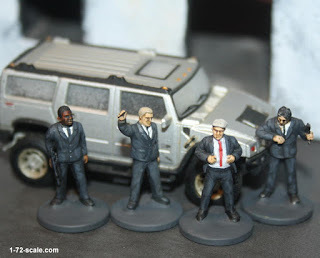 The heads were added as per this article on the MiniatureZone website. 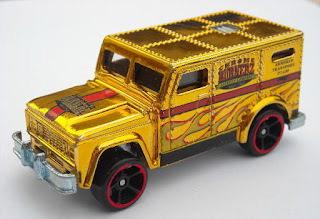 The armoured vehicles are repainted Matchbox Hot-Wheels cars. 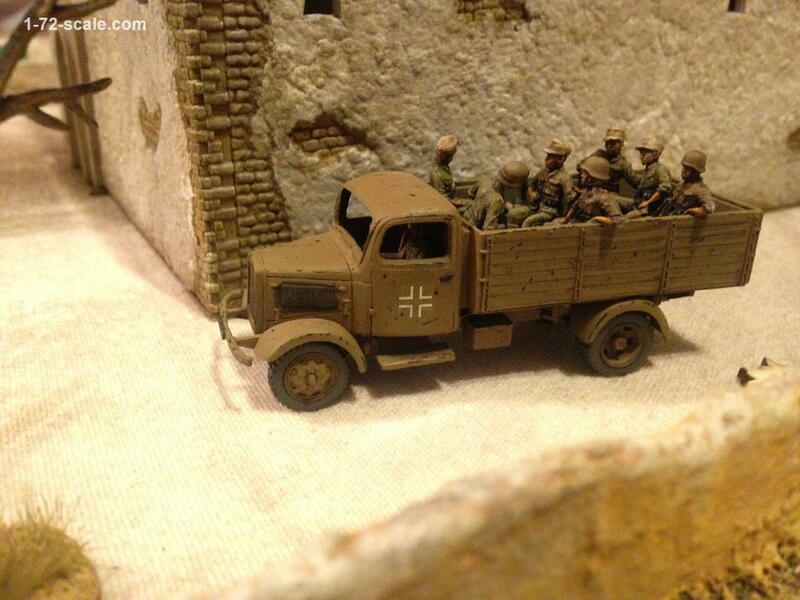 The cars were given new wheels taken off some old Russian trucks. More pictures will follow as work progresses on these guys. 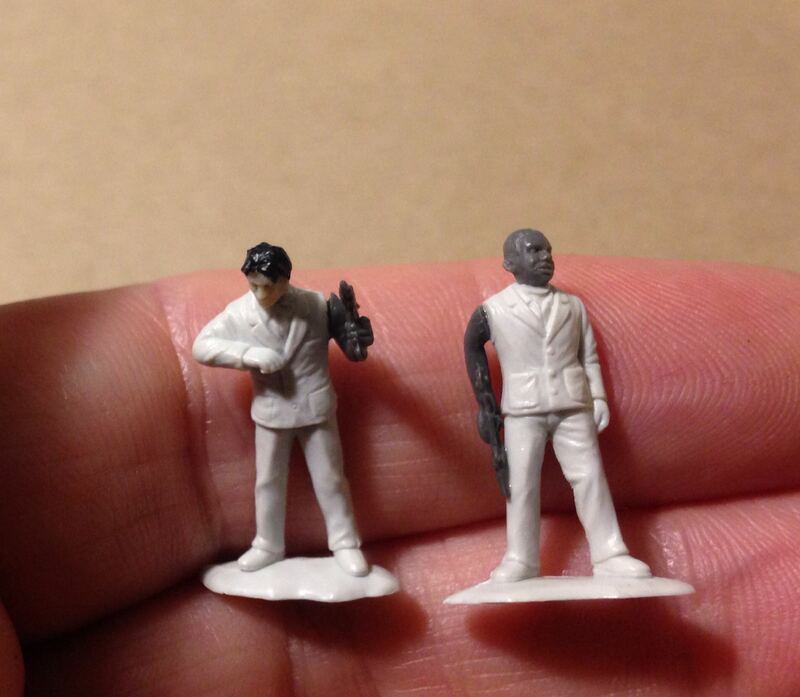 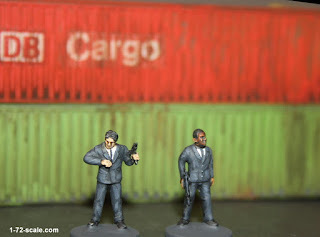 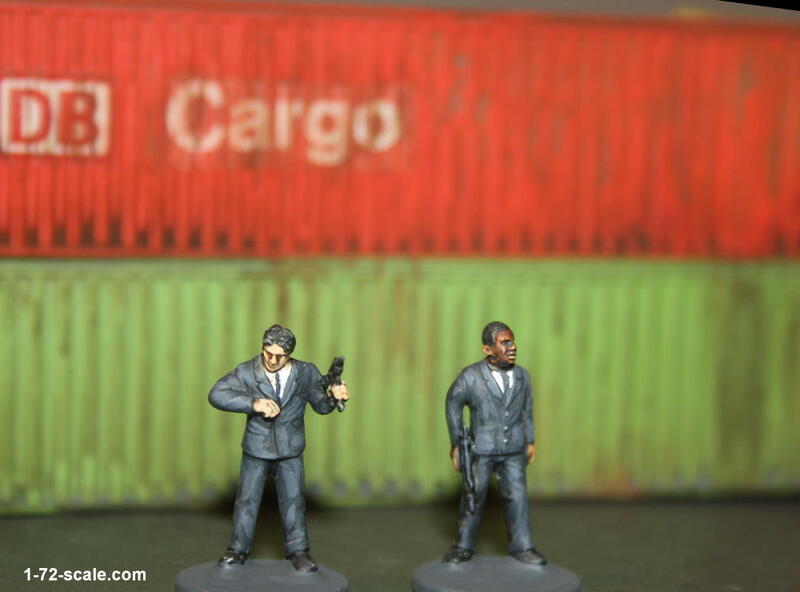 Two suited Uzi toting figures that could be either good guys or bad´uns. These are conversions from a couple of different sets. 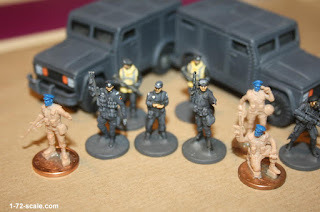 Anyone hazard as guess as to which sets have been used to make the figures ?